Lilies and Pink Champagne : Fashion Friday- "Fancy"
It drives me nuts when I wear dresses and skirts (which is all the time) and people ask me why I'm dressed up. They never believe me when I say that I just felt like wearing wearing it. Today I ran into someone from work at the grocery store and she asked me why I was so "fancy." Why do dresses and skirts automatically have to equal "I'm trying to be fancy"? I want a world wear I can wear whatever I want and curl my hair and people won't ask me what the occasion is. People that know me know that's just how I dress and I love them for it. They know when I'm going to the store and when I'm really trying to be fancy. Just because I'm running errands doesn't mean I have to wear sweats. 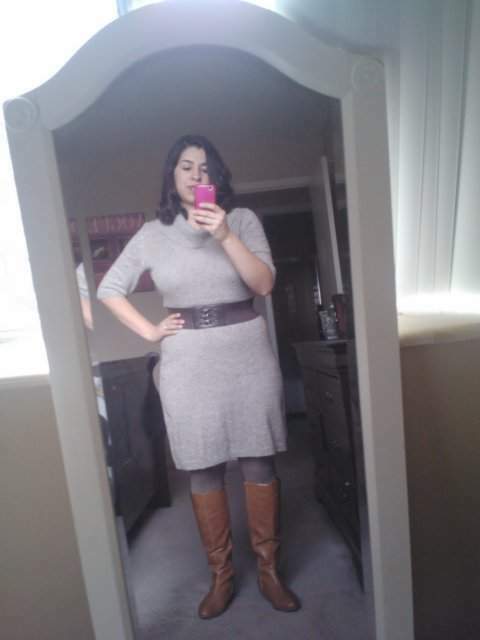 As for my outfit today, I feel I cheated because the belt comes with the dress. One of my goals this year is to buy more jewelry because I have started to realize the difference jewelry can make when it comes to an outfit. My fear has always been that I can't pull it off but it's time to forget the fear and just accessorize the hell out of my life!